Homma Family Photos of Amache and Wada Family DOJ documents. Rev. Masahiko Wada was an American Baptist minister for First Baptist Church, Garden Grove, Terminal Island Baptist Mission, Moneta / Gardena Valley Baptist Church (1929-1940) and First Baptist Church, Pomona (1940-1942). The Terminal Island Baptist Mission did not re-organize after WWII. Grandfather Kyushiro Homma was a denist (USC dental school graduate) and Grandmother Mutsu Wada Homma supported the church music ministries (USC Music School). The Homma family lived in Sawtelle, CA. On March 13, 1942, the FBI executed an arrest warrant under emergency authorization from the Assistant US Attorney Leo Silverstein. The Presidential warrant, number crossed out, was requested by the US Attorney of Los Angeles on March 10, 1942, file #100-12200 and #100-12201. As stated in the warrant, the charges against Kuni Wada were for “being a dangerous alien engaging in subversive activities.” The warrant stated that Mrs. Wada was a teacher at the Upland Kyosei-Kai Japanese Language School in Laguna which was indirectly controlled by the Japanese Gov’t by approving the books it used. Rev. Wada's, an American Baptist missionary and minister, charges stated on warrant D.J. 146-13-2-12-3447, were “Suspicion of Pro-Japanese Sympathy and Activities.” Rev. and Mrs. Wada were taken to the LA County Jail. Rev. Wada was then taken to the INS Tuna Canyon jail prior to being transferred to DOJ Camp at Santa Fe, New Mexico. Rev. 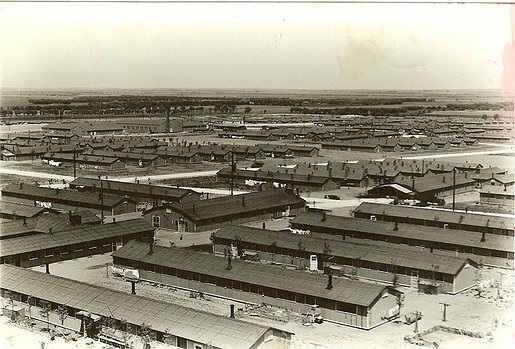 Wada was then transferred to an Army facility at Lordsburg, NM, 29-H-J-614 C.I, until the end of 1943. Mrs. Wada was taken into custody and jailed at the INS San Pedro Detention Center on Terminal Island then transferred to be “interned” at Seagoville Detention Center inside Seagoville Womens Federal Prison in Texas. The rest of the Wada children were sent to different internment camps. Michihiko "Mike" Wada, who return from New York after his parents were arrested, was sent to Pomona Assembly Center and Heart Mountain, WY, 14-8-24. Uncle Mike was eventually able to get transferred to Amache where he worked in the silk screen shop. Yasushi Wada, a Gardena High graduate and Univ. of Redlands student, was sent to Poston, AZ, Block 14-14-D until his parents and missionary friends were able to get him into Eastern Baptist Seminary in Philadelphia, PA. Midori, who was going to Pomona City College, went to Santa Anita Assembly Center with the Homma family and then Amache Colarado, 12K-12F, with the Homma family, 12K-12E. Midori wrote several letters to the US government and other ministers on behalf of her parents, trying to reunite the family. At Amache, Midori worked in the dental office and silk screen shop. As written in Part IV, of the famous Rev. Herbert Nicholson’s book, Treasure in Earthen Vessels, Rev. Nicholson was able to visit all the Wadas during the war in the different interment camp and detention centers. During a visit to Seagoville women’s penitentiary, Rev. Nicholson visited with Mrs. Wada for the afternoon. He talked about visiting Rev. Wada in Lordsburg, Midori and Mutsu in Amache, Mike at Heart Mountain, and Yas in Eastern Baptist seminary. Rev. Nicholson, from Pasadena and Pomona, was a good family friend and a missionary to Japan. While Rev. Wada was at Lordsburg in Nov. 1942, C.V. Hibbard, from the YMCA War Prisoner’s Aid Committee was able to send an English Bible and a note referencing working together in Japan. While in Seagoville, Mrs. Wada writes about the arrive of the Japanese from Peru. The men from Peru were taken to Kennedy, TX and the women and children to Seagoville before being returened to Japan. She writes about setting up a school for the Japanese children before their return to Japan. She also warns the Wada children not to try to visit Seagoville because travel is dangerous at this time. In late 1944, Rev. and Mrs. Wada were reunited in Crystal City, Texas prior to be paroled to Amache Internment Camp in Colorado where the Homma family and Midori Wada were being held. The American Baptist Home Missionary Society and other played a key role in getting Rev. and Mrs. Wada released after Dr. Kyushiro Homma suffered a fatal heart attack and stroke in Amache. Michihiko "Mike" Wada and Midori Wada worked in the Amache Silk Screen shop. The American Baptist Home Missions Society arranged for Rev. Wada to visit Minidoka Internment Camp from Amache to provide sermons and baptisms. This is where Rev. Wada met several people from the Seattle Japanese Baptist Church. The Wada and Homma families relocated to Seattle, WA via train after their release from Amache in September 1945. Their destination was the Seattle Japanese Baptist Church parsonage to restart their lives. Michihiko and Midori Wada resettled in New York after their release from Amache. mhomma — Last modified Sep 16 2017 9:51 p.m.